We were saddened to learn from Franz Brill that George passed away April 14. George was the founder our our Cabildo crewmember association. This excerpt from our website tells the story. In late winter of 1996, former crew members of the USS Cabildo, George Stokem and Willie Wilson, neither of whom had knowledge of the other’s existence, independently set out to try and find former shipmates. A pair of strangers were immediately united by the common interests of locating old friends and learning the later history of the ship. Each contacted the VFW Magazine to get a listing of names that could lead to a possible reunion. The magazine informed Stokem a man named Wilson had made a similar request the previous day. Stokem, a Plankowner who had served on the ship during 1945 and ‘46, promptly called Wilson who, it turned out, had been aboard in the 1951-54 period. It is impossible to heap too much praise on Stokem and Wilson for having the urge to embark on such a time-consuming project and the determination to bring it to fruition. Stokem concentrated on locating the men during World War II times, Wilson on those serving during his time on the Cabildo. By early summer, having located approximately 100 men, they made plans for a reunion to be held in Madisonville, KY in October, 1996. The response was good with 63 men, some with wives, bringing the attendance to 95. The USS Cabildo Association was formed, officers elected and by-laws approved. The first reunion was a big success and the next reunion was planned. Gradually crewmembers who later served aboard the ship found the association and were invited to attend the reunions. HARTFORD — George H. Stokem, 90, of Hartford, passed away Friday, April 14, 2017 at his home surrounded by his loving family. Born Feb. 26, 1927, in Patchogue, New York, he was the son of Harvey and Marguerite (Tate) Stokem. George graduated from Patchogue High School. He then enlisted in the United States Navy where he proudly served in World War II. George worked for the U.S. Postal Service in Patchogue for 20 years. Along with his wife Marion, they owned and operated a deli in Shoreham, New York. In 1972 they moved upstate where they owned and operated the Queen Anne Motel in Fort Ann for many years. This is where George formed many of his lifelong friendships and enjoyed getting to know the many people that passed through the motel. George was fun loving and kind. He loved to entertain his nieces and nephews with stories of the purple cow that gave purple milk. He was a devoted family man all his life. He was a loyal friend. George always worried and cared about everyone else. George was active in the Hartford community and served on several committees. He was very devoted to his church and served on the Vestry up until the time of his passing. He was a mentor to many. Survivors include his beloved wife of 63 years, Marion (Johnson), his sister, Helen (Francis), his son Glenn (Lori), his daughter Beth (Bob), his three grandchildren whom he was very proud of Katie, Keith, and Caitlyn (Brad), as well as two great grandchildren, Hailey and Levi. George is also survived by his step grandchildren, Zachary (Kristin), Jillian, David, Carrie (Matt), and Christopher (Lauren) and six great step grandchildren, Gianna, Octavia, Violet, Dominic, Lola, and Ethan. George is also survived by his neighbor and dear friend, David Smith. Other survivors include many beloved in-laws, nieces and nephews. There will be a Funeral Mass at 10 a.m. Tuesday, April 25 at the Zion Episcopal Church, 224 Main Street, Hudson Falls, with a military service following at the Gerald B. H. Saratoga National Cemetery, 200 Duell Road, Schuylerville. The family would like to give special thanks to his friend and doctor, Thomas Coppens, his special caregiver, Angie Ayers, as well as his nurses and aides from Fort Hudson Home Health Care and High Peaks Hospice, especially Penny and Stacy. The family suggests any donations in memory of George be made to the Zion Episcopal Church, 224 Main Street, Hudson Falls, NY 12839. All arrangements are under the care of Mason Funeral Home, 18 George Street, Fort Ann, NY 12827. 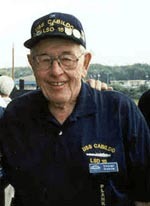 This page is maintained by Warren Gammeter <Webmaster@usscabildo.org>.